Heading home to Nashville today. It's about time. This is the longest I've been away from home since forever..okay, college..but that was just about forever ago. Whenever I come home, I try to pack as much as I can into the trip, but this time, all I want to do is just have some good food, see some friends, and hang out with the fam, in no exact order. Nashville is killing it on the foodie scene, so I am planning on checking out two of the new hot spots, Le Sel & Cochon Butcher. Probably won't be making it to RAD which is my #1 fave, but will definitely be making a trip to Barista Parlor which is probably #3 (Puffy Muffin comes in at a strong #2). 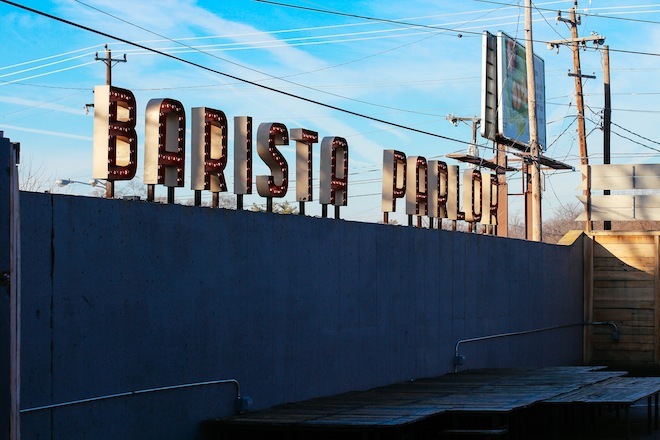 If you are in Nashville, you HAVE to go to Barista Parlor. You're welcome, in advance. Plus, it's a fave of Happily Grey, so it has to be good, right? I also may try to scam my family into going back to Coco's Italian Market or Firefly Grille (the classics), even though they just went to both within the last couple weeks. Word on the street is that Little Octopus and Avo are some other great new Nashville additions. Super proud of my hometown; they've come a long way. Be back Tuesday, because life (slash Columbus Day--it's a holiday, people). If you're ever planning a trip to BNA, make sure to check out www.NashvilleGuru.com. It is the best place to find the best things about Nashville. Oh and the founders are the best people. Three bests. *side note: this pic gives all the fuzzy feelings. Crisp, breezy, October day in Nashville. Can't beat it.